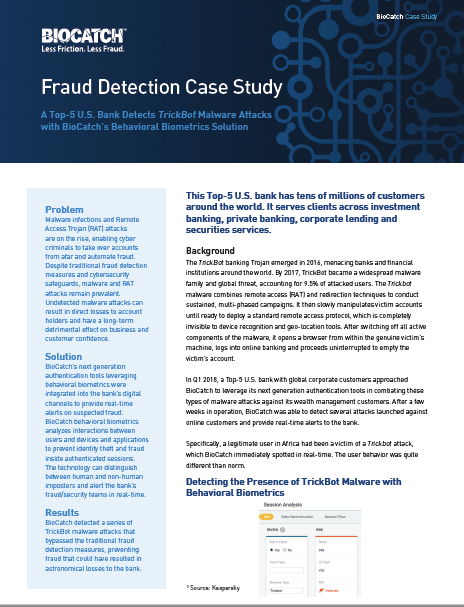 Today's leading corporate, retail and wealth management banks choose BioCatch to prevent new account opening fraud and account takeover fraud - all without generating false positives that sever the customer experience and overwhelm call centers. Here's why. Digital transformation in banking is rapidly evolving. In this fast-moving environment, where finance and fraud intersect, there are several ramifications for financial institutions that are trying to balance security, compliance and the desire for minimum friction. The equation is quite simple: where there is money, there is fraud. 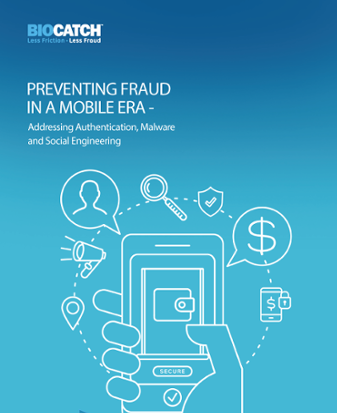 Traditional means of detecting fraud are not keeping up with cybercriminals, who employ malware, Remote Access Trojans and sophisticated social engineering schemes. Yet improving the customer experience and building trust is a high priority for banks looking to build loyalty and customer satisfaction. With less friction and less fraud, BioCatch delivers significant return on investment, making us the choice for today's leading financial brands.